Vinpower is the global exclusive distributor for the latest line of duplication quality Plextor writer drives, with the PX-891SAF drive. After a delay in production, Vinpower is happy to announce that the PX-891SAF, which is the replacement for the popular PX-891SAW, has arrived and is ready to ship. Vinpower Digital, a recognized global manufacturer and distributor of digital duplication equipment and accessories, has received the prestigious Plextor PX-891SAF Optical Disc Drives (ODDâ€™s) and is the exclusive worldwide supplier with drives already in stock in select markets. Contact Vinpower today if youâ€™d like to order these top of the line drives. â€¢	Secure Media Speed Stability – Ensures that media duplication speed does not exceed encoded maximum rates to provide better burning control and virtually eliminates bad burns. â€¢	Enhanced Recording Stabilization Control – Ensures all drives in a single duplication environment burn uniformly to avoid disproportionate speed fluctuations, which lead either to failed discs or less compatible completed discs. â€¢	Stable Recording Control – The drives have an extensive database of media specs and are better able to communicate and convey these details while burning the disc(s) at ultimate speed. â€¢	Stable burning throughout – Provides consistent and reliable burning of any file type for the duration of the duplication progress to ensure the recorded media has far greater reliability of playback or that the discs will successfully copy to begin with. â€¢	Archival Burning Capability – Able to burn virtually all makes of specialty archival media, including the 1000 year M-Disc brand. â€¢	Built using sturdier components – Compared to alternative drives, this model was built using the true Japanese design and parts lists for a stronger and more reliable system. 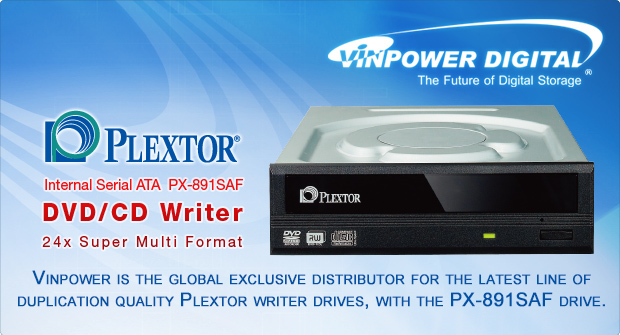 The Plextor PX-891SAF CD/DVD writer drive is immediately available and can be shipped anywhere in the world. Contact Vinpower for more details, or visit www.vinpowerdigital.com to learn more about the benefits and capabilities of this drive. There has been talk about the new Ultra HD Blu-ray format and when it will be available for some time now, but itâ€™s finally upon us. 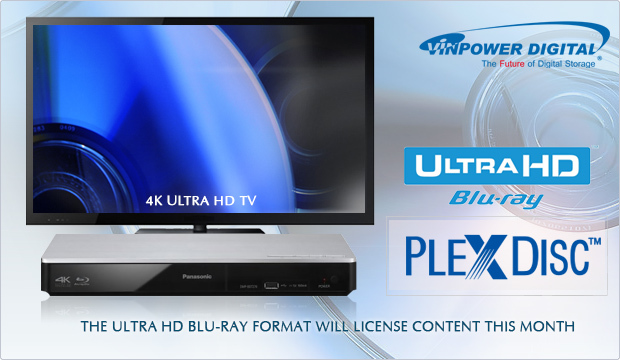 According to the Blu-ray Disc Association (BDA), they will begin licensing Ultra HD hardware and content on August 24, 2015. Since the players will be backwards compatible, all previous formats will also work in the Ultra HD players and with Ultra HD compatible TV sets. Even though some may look at this new Ultra HD as just another Blu-ray format, the expanded color range, high frame rate (up to 60fps) and up-to 3840×2160 resolution, along with the ultimate in audio technology, makes it the standard bearer in picture and sound quality for home viewing. In establishing licenses this month, ensures that there will be some exciting Ultra HD products and content available in time for the holidays. So if youâ€™ve held off jumping on the Blu-ray bandwagon, this may be the time to join the estimated 95.6 million people expected to be enjoying HD content by 2019. This also means that as TVâ€™s get bigger, picture quality and sound clearer, costs more affordable, and content getting bigger and bigger, optical discs with its superior capacity and the lowest cost per byte for digital content/storage, will continue to be a mainstay for many years to come. For more information about the latest developments about the digital duplication and content, visit www.vinpowerdigital.com or contact a Vinpower representative near you. Computer viruses are becoming far more prevalent and those developing these viruses are finding more unique and clever ways to infect computers and even mobile devices through flash devices. You could receive a flash device, such as a USB pen drive or SD card, from a trade show or as a promotional item and unbeknownst to you or the person that gave it to you, thereâ€™s a virus hidden within. These viruses could infect your computer or mobile device immediately upon inserting that flash item into your device. So what can you do to prevent this? The best thing to do is perform a full erase function using a standalone Vinpower flash duplicator. 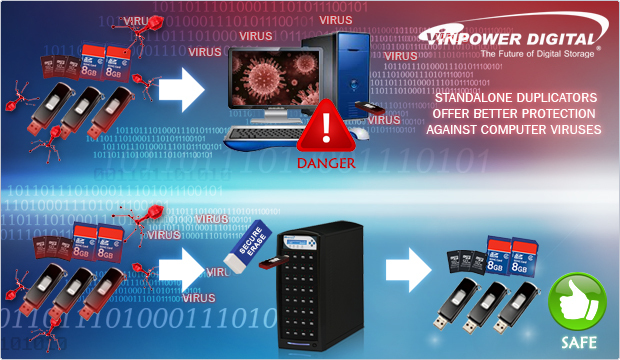 The reason our standalone flash duplicators are safe to operate even though the flash media might contain a virus is because the controller card for our devices are not based on a Microsoft or Apple operating system, but a more protected proprietary technology developed by Vinpower. That way the virus is flushed away before it has a chance to infect its intended target, your computer, tablet, or phone. Using the Vinpower Flash Duplicator(s) to completely delete all previous material, wipes out any existing content, including the virus, and limits the exposure that could put your computer or other device(s) at risk through the simple act of merely plugging in a flash device. Avoid the hassles and potential devastating loses by ordering a Vinpower standalone flash duplicator today. Visit our website, www.vinpowerdigital.com or contact a local representative for more details. 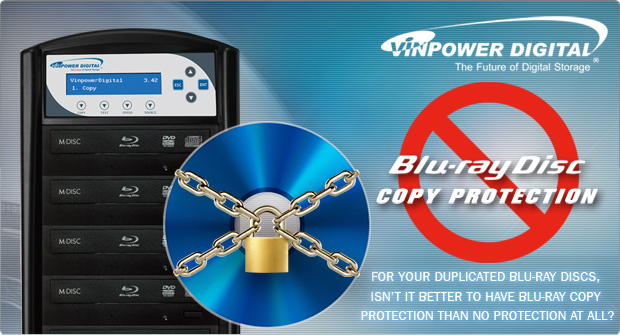 For your duplicated Blu-ray discs, isnâ€™t it better to have Blu-ray copy protection than no protection at all? When you leave your house, park your car, or bicycle, donâ€™t you take precautions and lock them up before you walk away? So if you have the opportunity, why wouldnâ€™t you add copy protection to your Blu-ray projects, for that added level of security? Regardless of whether youâ€™re making copies of your childâ€™s dance recital, a customerâ€™s wedding, or the movie you produced that you hope will one day be the next Hollywood blockbuster, isnâ€™t it worth adding protection to help prevent others from copying it and preventing you from capitalizing on your investment? Vinpower developed a simple method to embed a level of added security to Blu-ray discs that have been duplicated using our standalone SharkBluCP series duplicators. The SharkBluCP standalone duplicators come standard with the ability to copy all optical disc formats, including CD, DVD and Blu-ray, but with the advantage of being able to implement an extra level of protection that helps prevent others from making additional copies of your work. Nothing is 100% at preventing duplication, even the most advanced methods of protection can be defeated, but itâ€™s a lot better than no protection at all. So if the cost of the SharkBluCP duplicator is virtually the same a standard Blu-ray duplicator, why wouldn’t you upgrade to a model that offers the unique ability to embed BD copy protection, rather than nothing at all? For more details about the SharkBluCP or any Vinpower product, visit our website or contact a local Vinpower representative.